Sea level is projected to rise at least 16 inches along the California coast by 2050, with a 55-inch rise predicted by 2100. The primary impacts from sea level rise are increases in flooding and erosion. Sea level rise will expand the area vulnerable to flooding during major storms, as well as in the rare but catastrophic event of a major tsunami. The term 100-year flood is used as a standard for planning, insurance, and environmental analysis. People, infrastructure, and property are already located in areas vulnerable to flooding from a 100-year event. Sea level rise will cause more frequent—and more damaging—floods to those already at risk and will increase the size of the coastal floodplain, placing new areas at risk to flooding. King tides are exciting: The ocean creeps up and up into our faces, higher than usual, until we can’t help but stop in the middle of the Eureka Slough Bridge to gaze and wonder, “Where’d that skinny island go?” And then, driving around Humboldt Bay, we marvel at the overtopped dikes and waterlogged bay islands and other high-nibble shores. Real exciting — and unnerving to imagine in conjunction with sea-level rise. Well, here’s your task, you morbid water watchers: Some mighty king tides are coming in a few days, and Humboldt Baykeeper wants you to volunteer to go out there and document what happens at “vulnerable areas of the bay’s shoreline,” as it notes in a news release. The highest and lowest tides of the year — commonly known as king tides — will hit North Coast beaches this week, but won’t cause as much of a splash as in previous years, according to National Weather Service meteorologist Alex Dodd. This year’s king tides are predicted to range from 8.29 feet to 8.65 feet above the Mean Lower Low Water mark — lower than the average of 8.79 feet — and will mostly remain at those heights due to good weather, Dodd said. 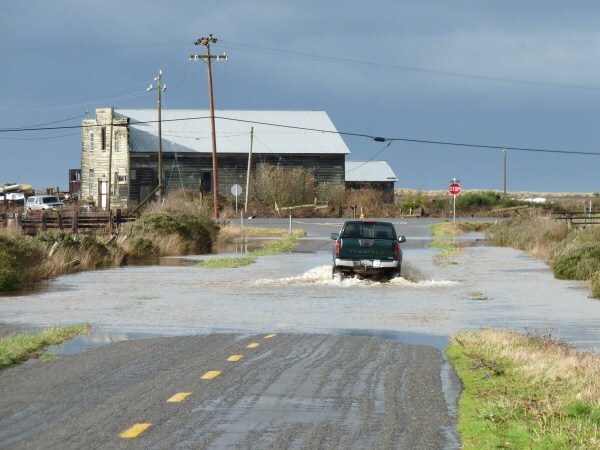 For Humboldt Baykeeper policy director Jennifer Kalt, king tides provide a visualization of the impacts of rising sea levels on habitats and infrastructure near Humboldt Bay. As a way to display these impacts, Humboldt Baykeeper started their King Tide Photo Initiative in 2012 to create a visual database illustrating how the temporary rise in sea level caused by king tides can effect areas near the bay. The photos are mainly submitted by volunteers who photograph structures being hit by the abnormally high tides. For this year’s initiative, Kalt plans to expand the number of areas photographed as well as revisit some of the areas photographed last year. Kalt said that the issue of sea level rise will go beyond infrastructure. Aldaron Laird, an environmental consultant for the Humboldt Bay Sea Level Rise Adaptation Planning Project, said that it is important for people to see king tides for themselves. In January, Laird completed a study funded by the California Coastal Conservancy on the effects of sea level rise on Humboldt Bay. The study referenced a 2012 study from the University of California Santa Cruz, which found that Humboldt Bay had the highest rate of sea level rise in California at 18.6 inches per century — more than twice the state average, according to Laird. Laird’s study also showed that since 1977, 12 king tide events have exceeded the average of 8.79 feet for Humboldt Bay, with seven of those occurring since 2000. Dodd said he has not seen any abnormal changes in king tides over the years, but said sea level rise will have an impact on them. “The common sense answer is if the sea level rises, then that is going to result in a higher water level and tides on top of that,” he said. For the North Spit of Humboldt Bay, high tides are expected to reach 8.29 feet at 9:09 a.m. on Monday, 8.56 feet at 10 a.m. on Tuesday, 8.65 feet at 10:52 a.m. on Wednesday and 8.54 feet at 11:42 a.m. on Thursday, according to tide predictions from the NOAA Tides and Currents website. The Humboldt Bay Harbor, Recreation, and Conservation District and Humboldt County Public Works Department invite the public to an informational meeting on planning for the potential effects of sea level rise around Humboldt Bay. The meeting will be held on Tuesday, November 12, from 6 to 8 p.m. at the Humboldt Bay Aquatic Center, room 203, 921 Waterfront Drive, Eureka. This meeting provides an opportunity for the public to learn about the sea level rise project and ask questions of the sea level rise adaptation planning team. How we will prepare for rising sea levels is just beginning to take shape here in the Humboldt Bay region. Humboldt Baykeeper has assessed sea level rise vulnerability for contaminated sites near Humboldt Bay. 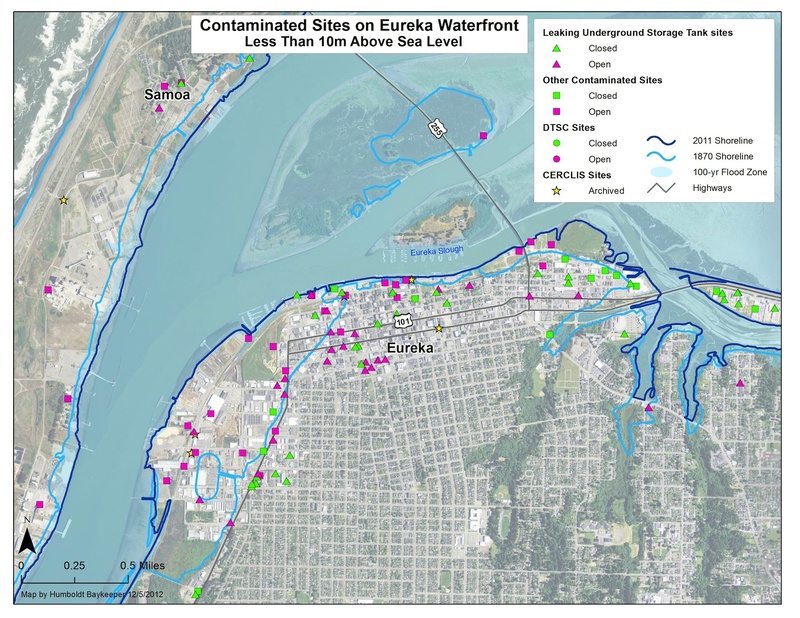 More than 300 contaminated sites are within 10 meters of current sea level, including more than 40 that are below 2 meters – the amount sea level is projected to rise by the year 2100. A report to the State Coastal Conservancy by Aldaron Laird, Brian Powell, and Jeff Anderson.